Tweet At this point, I've shown you a good amount of fun alcohol toys.. but obviously there's still plenty more out there. 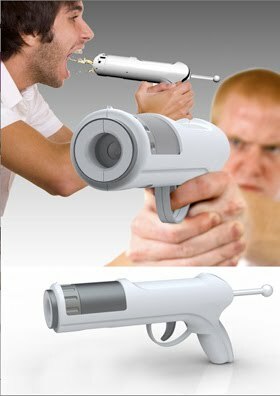 Today I just have to present to you the Booze Shotgun. It holds about an ounce of cherry vodka [or whatever lame liquor you like] in it, and when you shoot, the alcohol comes rushing out, straight for the back of your throat. So basically, a quick shot, as little taste as possible, and you look cool doing it. Win, win, win! It's $20 on this site, or eBay had some for cheaper. It seems like a deal to me! You'll be the life of the party! ...Just watch out for the Herp.